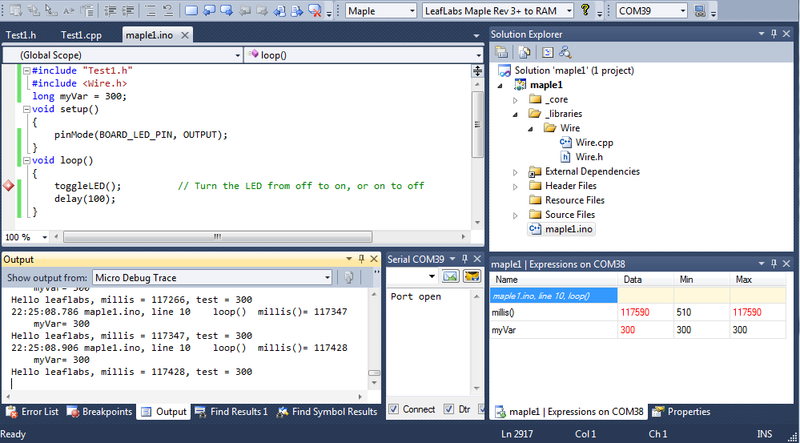 It is possible to add an Applications.txt file containing additional IDE entries in the Visual Micro Applications list. The default "My Visual Micro" location is "MyDocuments\Visual Micro". Please note that it is possible to override this location in "Tools>Options>Visual Micro"
An Applications.txt file can be placed in "[My Visual Micro]\Micro Platforms"
Copy the following properties into an Applications.txt located in the "[My Visual Micro]\Micro Platforms" folder. The items in bold must be changed for each application. The TestIDE. ide prefix to EVERY key must be changed to a new value for each board. Example: Paste all of the keys below into a new Applications.txt. The values of keys in the first section. Blank lines are ignored. # can be used to "comment" an entire line. NB: The .winreg keys represent the name of a key in the windows registry. The registry keys are created below "HKCU\Software\Visual Micro\Locations"
NB: The sketchbook.winreg can optionally be changed to provide a different sketch book folder storage key. Visual Micro makes special use of Visual Studio C++ Shared Projects for both project and library development. C++ shared projects were released in Visual Studio 2015 and are improved in the soon to be released Visual Studio 2017. Use "File>New>Project>C++>Arduino Library Project" to create a new library project or the "Add Library" menu to create from existing library code. When creating a project from existing library code, the code remains unchanged and compatible with the Arduino IDE. There are two types of shared projects that Visual Micro supports. It is important to understand the difference. Shared "library" projects that contain an Arduino format library.properties text file in the project root are compiled as Arduino Libraries. Shared "code" projects do not contain a library.properties text file. During compilation of shared code projects, the code is merged with the main project code in the temp build folder. In this case the code can be accessed as if it was within the folder structure of the main project. Multiple main projects can use the same shared project(s). Intellisense in shared projects is powered by the current "Startup Project". A shared project can not be compiled directly, can not be a Startup Project and does not have a fixed platform. tip: Adding a new library project to an official Arduino library folder will automatically make the library available for use in the Arduino IDE. Shared projects can be created using the standard Visual Studio new project wizard. Visual Micro also provides a simple way to create a shared project for an existing Arduino library. Shared projects that contain an Arduino library.properties in the root folder are considered to be Arduino Libraries. If the library.properties file does not exist the shared project is considered part of the main project. 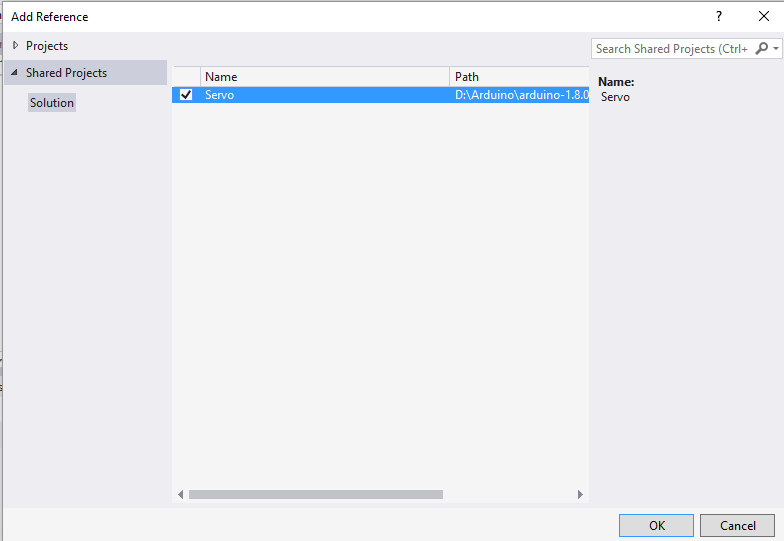 The "References" node of a Visual Studio project enables shared projects to be referenced by a master project. Some of the magic of shared projects is that they do not have a specific architecture. Instead the architecture (intellisense etc) is taken from the "Startup project" of the current Visual Studio solution. This enables us to develop cross-platform code whilst benefiting from intellisense for a specifc architecture. in fact VS2017RC takes this a step further but that's for another blog. 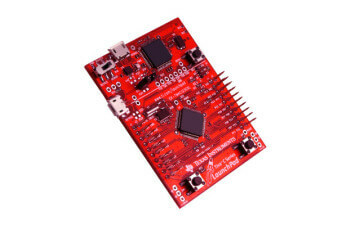 Using a shared library project is no different to using normal Arduino libraries. 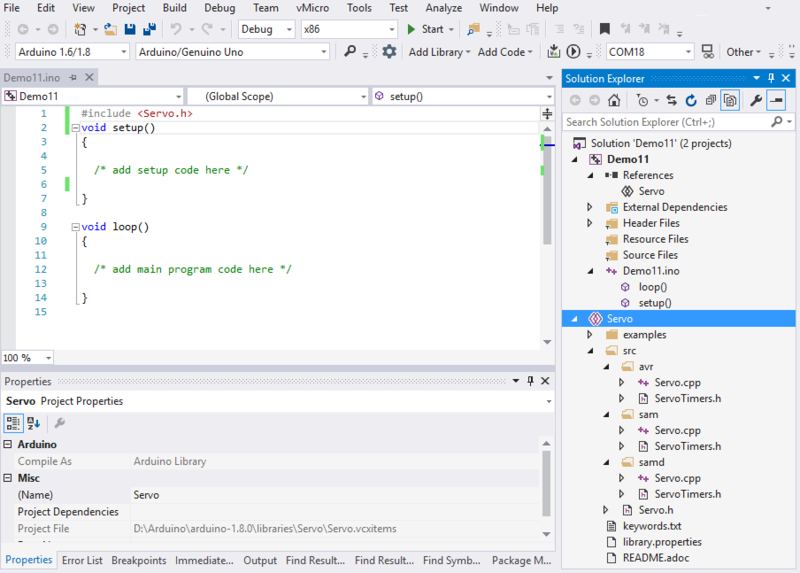 In fact they are normal arduino libraries except they also have a .vcxitems file in the library root which simply allows Visual Studio to show the source code during development (in a solution). Shared library projects must be #included in the code in the same way as a normal Arduino library. The fact that we are using a shared project for development has no bearing on the compilation. The compliation works as normal and compiles the library as it does for all other libraries. A useful difference between a shared library project and a normal library is that Visual Micro can find the library in any location, not just the published known Arduino library locations. This has many benefits for source control and also versioning. It is possible to create a shared library project and add it to a solution with a single click. All users must add a reference to the shared project to the master project(s). Right click the "References" node of a master project in the solution explorer to add the reference to the Shared Project (library). This ensure the intellisense of the shared project will know the correct architecture. 2) Add a library to a project in the usual manner. If the project already uses the library it will not cause an issue. If the lib headers are not required in the .ino file you can remove them. So that intellisense can detect the correct platform, a reference is added to all master projects in the solution that use the library. Right click the References node of a master project and then click "Add Reference"
4) When the Add Reference window opens, cick the "Shared Projects" tab and put a check mark against the library project(s) you want to use in the current master project. These project properties can now include merge field expressions that make use of any of the build properties. tip: All build properties can be viewed during compilation by switch on "tools>options>visual micro>compiler>show build properties"
2013: Editors Note: Our impression of the Maple Ide is that it is not yet as mature as some of the other solutions and the usb drivers stop working frequently. 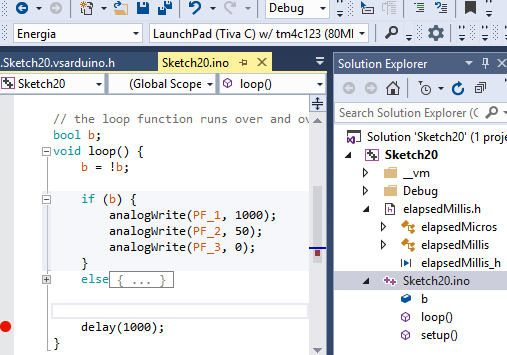 Maple has been added to the free plugin and the debugger by user request. Our personal option is that Maple is not very easy to use or support and might lead to fustration for less experienced users. If you find this not to be the case then please contact us. 14th Jan 2013: Apparently build and upload now fully supported for maple REV6 boards (thanks Yuri). Debug trace/break is supported. 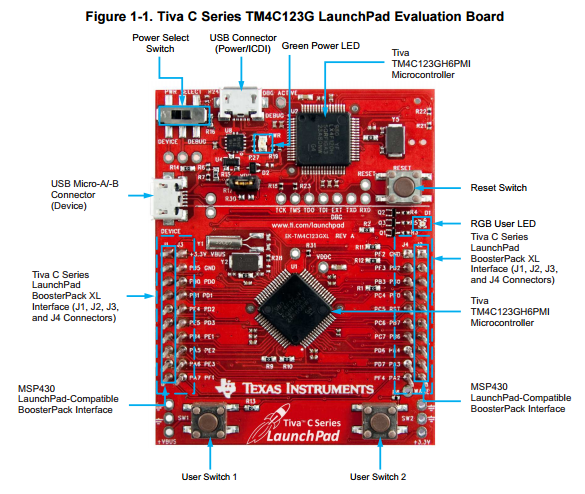 Other maple ide boards have not been tested. We would appreciate feed back to the forum from experienced users. On windows 8 the Maple usb can completely disappear. The Hit Count >= settings can be used at the moment with Stm32 because it does not initialize variables correctly when in the Global space.